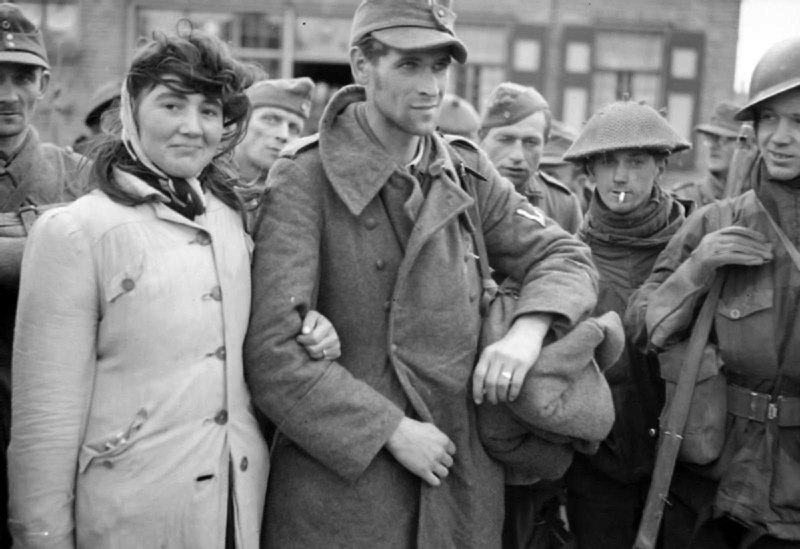 Amongst the prisoners taken at Walcheren was Dutch woman along with her husband, a German soldier, whom she refused to leave. November 1944. A Dutch woman is seen here with her husband, a German soldier that she had married during the German occupation of the Netherlands. Refusing to leave his side, she marched with the German prisoners to the Prisoner of War holding center. Picture taken in Walcheren, Zeeland, the Netherlands. November 1944. Following the refusal of the Dutch government to return after the German invasion, the Netherlands was controlled by a German civilian governor, unlike France or Denmark which had their own governments, and Belgium, which was under German military control. The civil government, the Reichskommissariat Niederlande, was headed by the Austrian Nazi Arthur Seyss-Inquart. The German occupiers implemented a policy of Gleichschaltung (“enforced conformity”), and systematically eliminated non-Nazi organizations. Not all Dutch offered active or passive resistance against the German occupation. Some Dutch men and women chose or were forced to collaborate with the German regime or joined the German army (which usually would mean being placed in the Waffen-SS). After the war, some accused of collaborating with the Germans were lynched or otherwise punished without trial. Men who had fought with the Germans in the Wehrmacht or Waffen-SS were used to clear minefields and suffered losses accordingly. Others were sentenced by courts for treason. Dutch women who had sexual relations with German soldiers were publicly humiliated. Some were proven to have been wrongly arrested and were cleared of charges, sometimes after being held in custody for a long period of time. What she did would have taken lots of courage in those times, she obviously loved the man very much. You can't stop love and whether it was German occupation or not she loved this man and was very loyal. That's like saying the women who marry ISIS terrorists are brave young women who are loyal to the men they love. That man committed atrocities against humanity by being a Nazi in the first place. You guys certainly have a perverse idea of devotion. Ya know that not every German soldier was a Nazi at the time? What a stupid comparison. Saying that all German soldiers were Nazi war criminals is as ridiculous as saying that all Muslims are ISIS terrorists.